Diffusers come in many shapes, sizes, types, hours of automatic operation, ease of use and size of the room they cover. Nebulizing diffusers do not require heat, or water, and contain no plastic. They work by using a stream of air pressurized air that blows across a small tube, creating a vacuum that pulls the essential oil to the surface of the tube where it is blown away in a fine mist. Ultrasonic diffusers are the most widely used and they work by creating a fine mist using electronic frequencies to create ultrasonic vibrations that break up the mixture of water and essential oil molecules. Evaporative diffusers work by releasing essential oils into the air as it turns from a liquid to a gas. These models usually use a small fan that blows air past the oil, causing it to evaporate at a faster rate than normal. These diffusers are typically the least expensive. Heat essential oil diffusers are similar to evaporative diffusers, except that they use heat and a fan to release the essential oils. Because this type uses heat it can change the chemical composition of your oils, which can make the scent more or less intense depending on the temperature. Quality – All high-quality diffusers use polypropylene, or another strengthened polymer or material. Aromatherapy can be defined as, part science and part art. 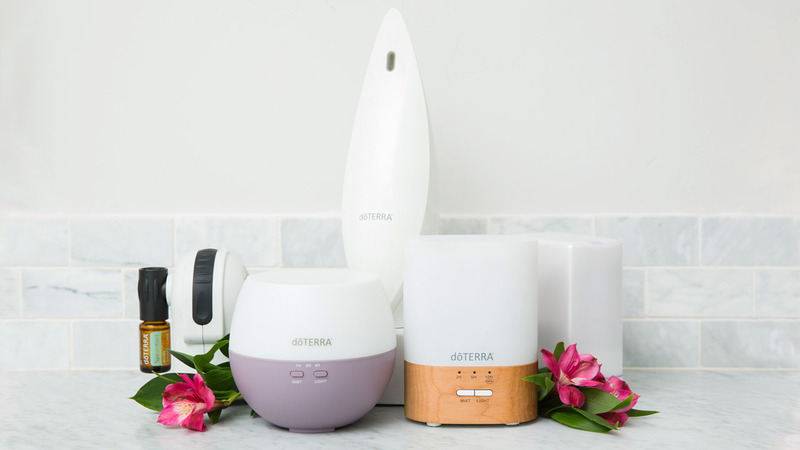 By diffusing or applying directly to the body natural essential oils from plants you can balance, harmonize and promote the health of your body, mind, and spirit. Aromatherapy helps with the physiological, psychological and spiritual processes to enhance your natural healing. In essence, it is the therapeutic application or the medicinal use of aromatic substances (essential oils) for holistic healing. An important element of aromatherapy is synergy, which is the combination of the various essential oils that can actually create a more powerful effect than the individual oils alone. That’s why blending essential oils is such an important area of study since the range of possibilities is almost endless. Use doTERRA’s “Chemistry Wheel” to assist you in developing your own aromatherapy recipes and use our “iPhone EO Recipes App” or “Android EO Recipes App” to determine the costs quickly and easily.